1933: Centenary 5 s. black & yellow, fresh mint example of excellent colour and centering, large part og. A scarce stamp Gi = £ 750. 1891 (Feb 19): Envelope to London, addressee’s name cut away, franked by ½ d. on diagonal half of 1 d. brownish claret together with a block of four ½ d. on 1 d. brownish claret all cancelled by several strikes of “F1” obliterator in black, Falkland Islands cds at base of envelope with London (April 13) arrival cds in red on reverse. An extremely rare piece Gi = £ 2’300 off cover. Provenance: Collection “Stanley”, London, March 1998. 1936 (3. Dezmber ) : not Carried out 21. 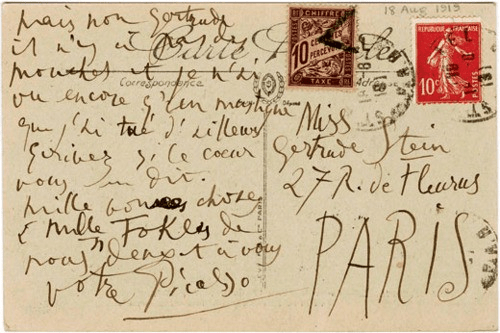 South America Flight, registered cover franked by both Zeppelin stamps to 1 Fr. 2 Fr. from “Triesenberg 30. XI. 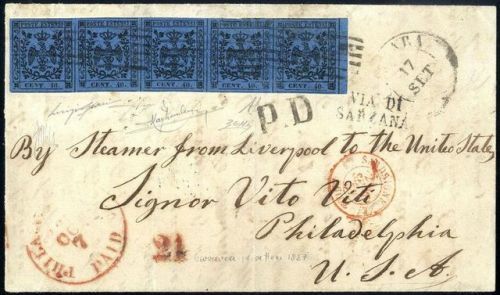 36” to Rio de Janeiro with reverse railway cancel (TPO) “Frankfurt Basle” and arrival postmark from 5. December. The planned drive the Hindenburg fell from and already dispatched postal service shipments were with the Lufthansa from Frankfurt (3. 12. 36) and Catapult postal service (South Atlantic) to Brazil transported. A rare document see SHL FF 34. 2. d.